"Autumn is the perfect season for hiking the countryside. The air is crisp and invigorating; the light radiant and alive. Vistas painted crimson, gold and flaming orange by the frost-touched trees await the delighted walker around each bend. "Autumn Lane follows a rural road into the cool depths of an autumn forest. The season is rich with the pleasures of the season; the quiet shadows are deep, the morning lights brilliant; the hardwoods are simply on fire with their autumn colors. "In a much admired earlier tribute to the season, I entered an Autumn Gate to discover the elegant pleasures of a grant country estate. By contrast, the joys of the Autumn Lane are rustic; here is the merest hint of a human presence in the few standing boards of an ancient, weathered fence. "I find that a country lane is a lovely invitation to my imagination. On my rambles, I delight in anticipating what might lie around the next bend in the road; but I'm often startled by nature's beauty. So be my guest — try to guess what you'll see next on my Autumn Lane. But prepare to be surprised." 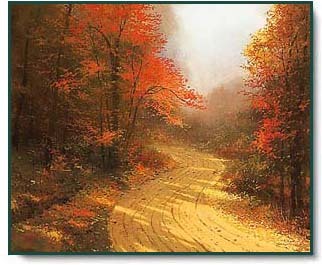 Autumn Lane copyright© 1995 by Thomas Kinkade.